The largest South Korean concert in the United States will be taking place on Aug 10! Nine chart-topping K-pop acts will be sharing the stage at the much-talked about music extravaganza. They are SNSD, SHINEE, 2PM, 2AM, CNBLUE, KARA, Sistar, Secret and MBLAQ. 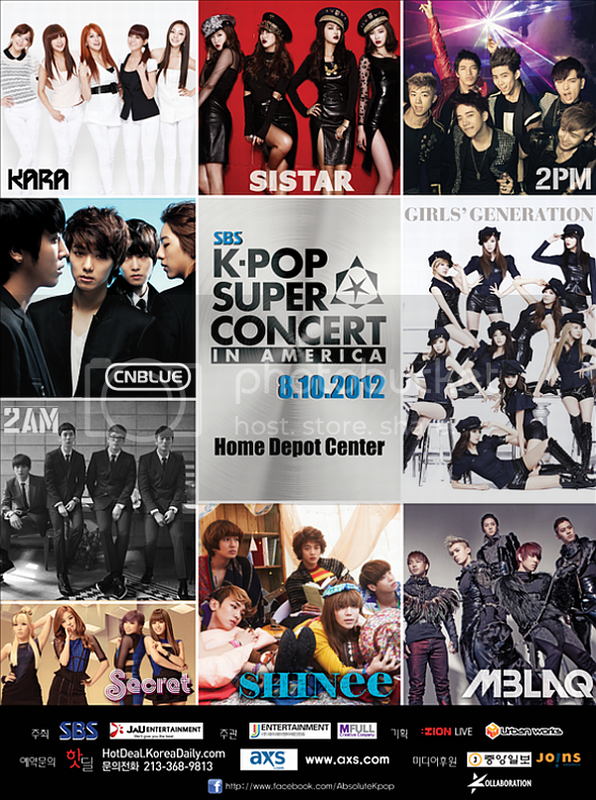 The SBS K-pop Super Concert in America will be held at the Home Depot Center in Los Angeles. The venue reportedly accommodates an audience of up to 27,000! It is hoped that the K-pop Super Concert will bring awareness of the Hallyu to the mass market and satisfy all existing K-pop fans in the US. The event is hosted by SBS Broadcasting System Inc., JAU Entertainment Inc., and Zion Live Inc. The mega-event will be broadcast on the South Korean TV station SBS.